What are the Utility Features of the 2018 Ford F-150? Best-in-class towing capacity of 13,200 lbs. Best-in-class payload capacity of 3,270 lbs. 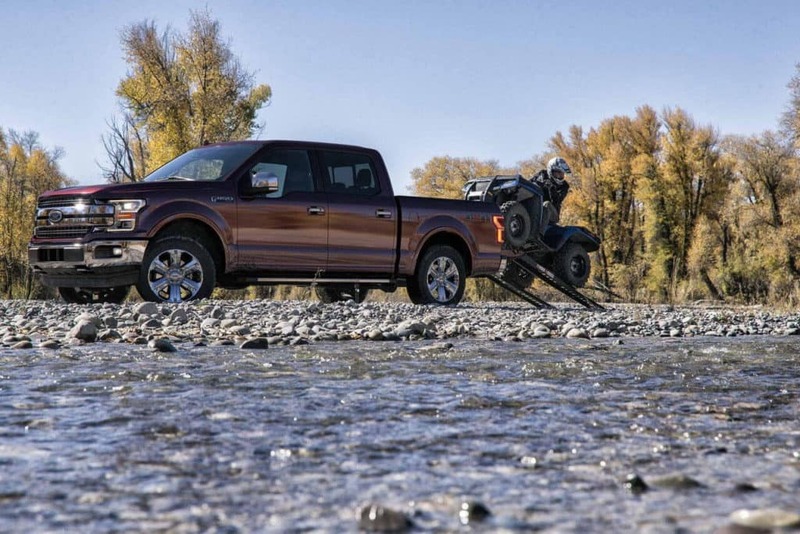 The twin-turbo 3.5L EcoBoost V6 engine allows you to tow up to 13,200 lbs. when accompanied with the Max Trailer Tow package. The class-exclusive Pro Trailer Backup Assist synchronizes your trailer with truck steering to make backing up easy with the press of a button. The Ford F-150 bed size is offered in three lengths. A 5.5 ft box, a 6.5 ft. box, and an 8 ft. option allow you to choose the size that best suits your needs. Another class-exclusive feature, you can lock, unlock, and lower the tailgate remotely for your convenience when loading or unloading the bed. There’s more in store, too, like LED box lights and stowable loading ramps. Find out all the 2018 Ford F-150 can do for you by making an appointment with us today. Call our sales team at 970-945-2317.